Out of the three cocktails at my sister- and [now] brother-in-law’s engagement party, the Meyer lemon whiskey sour went most quickly. Honestly, I was shocked at its popularity — but by then I had grown partial to the [not-your-grandfather’s] old fashioned and blood orange martini — and wished I made more, in part because it was by far the easiest to concoct. Water, sugar, a couple Meyer lemons and your favorite gluten-free bourbon (mine’s Bulleit) are all you need — no sour mix! I love the comparatively mild acidity of the Meyer lemons, plus their slightly orange, floral flavor. These nuances are captured through the use of their juice, in addition to infusing the simple syrup with their peels (which make for a spectacular, edible garnish [candied lemon peel]). I love that with the chiller weather comes a wide(r) variety of citrus, don’t you? 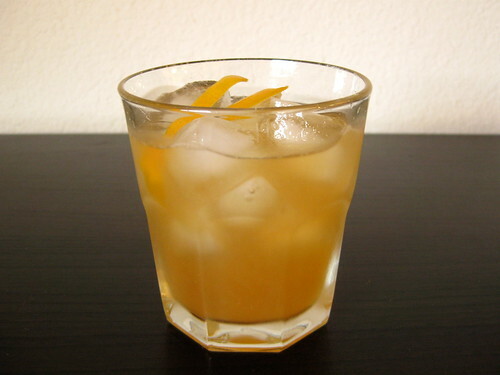 Combine bourbon through lemon juice in a Mason jar or cocktail shaker. Add ice, cover jar/shaker, shake vigorously until cold and strain into a glass over fresh ice. Garnish with a few pieces of candied lemon peel (from the infused simple syrup), if desired. Serve immediately. Place lemon peel in a heatproof jar (1 cup capacity or larger). In a small saucepan (2-quart), combine sugar and water. Set over high heat, cook until sugar dissolves and mixture comes to a steady simmer (immediately returns to a simmer when stirred). Immediately pour hot simple syrup over lemon peel. Allow to cool to room temperature before using, or covering and refrigerating for up to 1 week.